The PacSafe Coversafe X100 keeps your passport and key essentials are kept safely undercover and away from prying eyes and slash-happy, hands with this slash-resistant, RFID blocking waist wallet (freq:10MHz to 3GHz). Whether you’re on a city break, backpacking or headed to the market, you can breathe a little easier with Anti-theft RFID Blocking Waist Wallet. Flexible, lightweight, stainless steel wire is integrated into our adjustable Carrysafe® straps making it invisible to the eye, yet very effective at helping to prevent bag slashers from slicing through and running off with your gear. 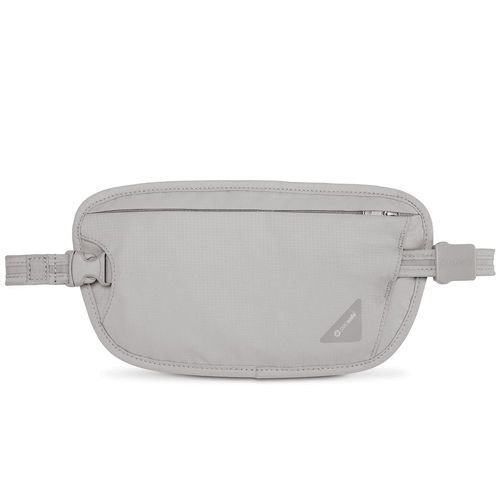 Waist Circumference : 29.1" - 45.9"
The Pacsafe Coversafe X100-Neutral Grey has many exciting features for users of all types. It's one of FactoryOutletStore's best selling Pacsafe Coversafe. You can extend the lifetime of your Pacsafe Coversafe X100-Neutral Grey with the purchase of a FactoryOutletStore Factory Protection Plan. See the Pacsafe Coversafe X100-Neutral Grey gallery images above for more product views. The Pacsafe Coversafe X100-Neutral Grey is sold as a Brand New Unopened Item.